WHITE ROSE GLITTER Prom Corsage in Haslett, MI - VAN ATTA'S FLOWER SHOP INC. This is our take on a modern and fun way to do corsages! Built on bendable cuffs to fit all wrist sizes. Succulents are very long lasting! 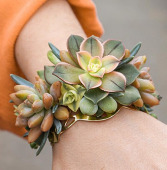 Please note that succulents will vary in color and size, but corsage will be built as similar as possible to photo. If you would like touches of a certain color added, please indicate that in 'Special Instructions'. This cuff comes in gold, silver, and rose gold. Please also indicate your preference in checkout.